When a major brand diversifies it needs to ensure that the purpose of the exercise (making money), does not conflict with the message (selling their brand name). Bland packaging is often the result. 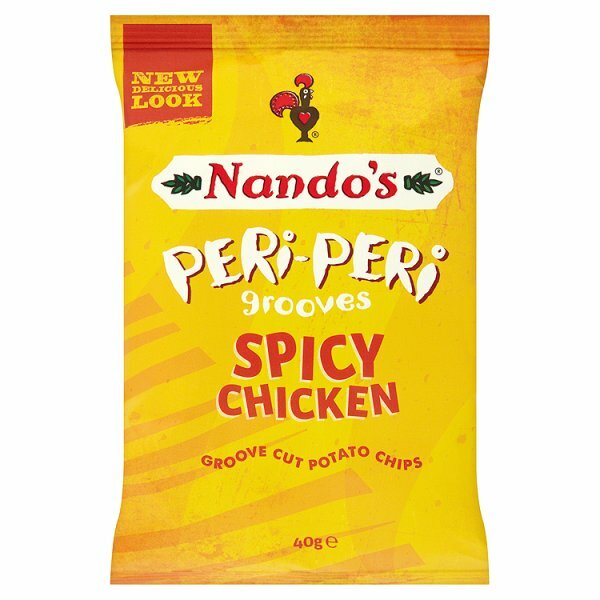 And although these feature the brand logo and the flavour in Nando's style text, plus of course the little Portuguese chicken, this packaging does the job sufficiently well and actually looks okay. Although thickly cut these Crisps crunched like a thin wafer biscuit. The mush stage appeared a little early for such a well oil hardened Crisp, but it was nevertheless satisfactory for a Rippled Crisp. As with the majority of Ridged Crisps, these were thickly cut. The Ridges were relatively thin compared to some and this even allowed room for visible oil blisters, which is very rare. The surface of a Crisp was partly see-through, such was the saturation of the oil. There were also some crusty areas with skin visible and dark orange areas of seasoning. There was very little aroma for a hot and spicy Crisp. In fact there was very little hot and spicy about it. When we think of Nandos we think of the extra hot sauce that we lather all over their chicken, but these were far nearer the mild sauce, which was frankly disappointing. The flavour had little meatiness and was as much Mustard as it was Peri-Peri. On one hand you can understand a major international chain trying to appeal to a mass audience, but if you’re going to do something you really should do it right.